When a 1000cc sports bike isn’t enough, what do you do? You blow a load of money on a special edition of course. Four of the best ‘R’ versions head to head, are they worth the extra cash? Shot taken just before they all sank into the sand. No, really. “F***ing hell you guys have got a nice set of bikes”, comes the call from a dude in a random layby somewhere on the North Devon coast. Layby man has been hanging around for a while now, shooting glances in our direction and has decided he can remain a quiet spectator no longer. He’s waiting for his mate who’s in the process of cycling from John O’Groats to Lands End, but the sight of these four has him distracted. As he wanders off, satisfied that he’d have the Ducati in his dream garage, it’s easy to see why he had to come over. A quick count up totals around eighty grands worth of bikes here. And it’s not just the price tags that make ‘em special. 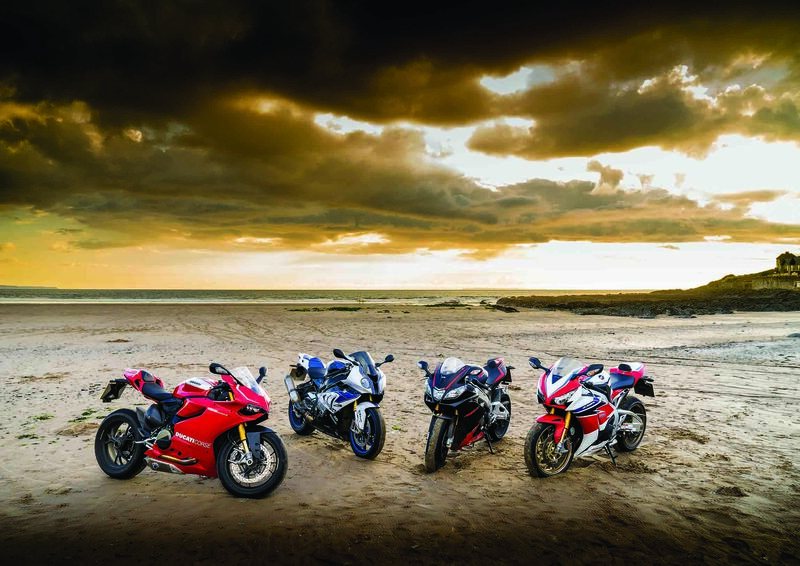 These four are the top-line, high roller sports bikes from Ducati, Honda, Aprilia and BMW. They don’t make ‘em any tricker than this. So here’s the rub, 1000cc sports bikes already have more performance than most people can use, period. 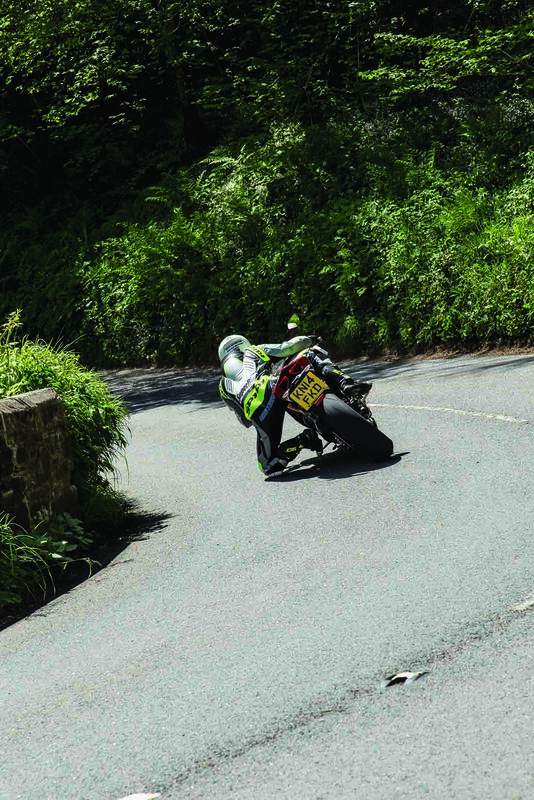 When you’re riding on the road, it’s hard to even get close to full throttle on the latest superbikes; why on earth would we need more performance? There are plenty of clever answers why; better bikes are nicer to ride at any speed, for instance, and having a limited edition model always feels more special. But the real reason is probably just ‘because we can’. We don’t need to ride faster, but we do because we want to, so here’s to unnecessary excess and the fruits it brings. Ladies and gentlemen, the Special Editions test. Take a look at the photos of this test and you’ll notice some inconsistencies in the kit we’re wearing. Shaun and I are head-to-toe in full Power Ranger-spec race leathers, looking every bit like we’re heading straight to a trackday. Meanwhile John and guest tester Llel are keeping it vaguely imaginable with jackets and jeans. The point of this was to illustrate the two main types of people who are likely to buy one of these bikes. In the jacket and jeans corner you’ve the people who are cruising around, enjoying being on a pimp bike but never likely to sniff the glue on the edge of the performance envelope. In the one piece leathers corner you’ve either got the serious sports bike fans, who crave the extra performance, or the people who can afford the very best, so why not have it? There’s a school of thought that asks why would you risk an eighteen-grand bike on a trackday, just as there are people who would ask what’s the point of all that performance if you’re not going to use it. It’s personal and we don’t think there’s a right or wrong answer. If you can afford one of these bikes, forget reasoning for it, just get stuck in – have a read of this and see which ticks your box. If (like most of us) a bike that costs nearly twenty grand is only ever likely to be a dream, then the next few pages will ensure you’re dreaming about the right bike for you. Shut up, shut up, shut up, please, please just be quiet. Please? I’m rolling through a 40mph limit at 38mph on the Ducati Panigale R, with a traffic cop pointing a radar gun straight at me. The pleading is from me to the bike as I try to make myself inconspicuous so I can get on with my day without a fifteen-minute lecture about the benefits of a high-viz vest. The Panigale doesn’t do inconspicuous. The Panigale R really doesn’t do inconspicuous. It’s loud, stunning, fast and loud again. It makes loads of noise too. Did I say it was loud? Trying to blend in on any of these bikes isn’t easy, but the Panny eclipses all of them with its sound, its looks and the riding experience. The Honda Fireblade, SP or otherwise, is not a comfortable bike. It’s a sports bike people and that means low bars, high pegs and wind protection that requires your head to be in contact with the fuel cap. However, after 120 miles, mostly on motorway, on a Ducati Panigale or an Aprilia RSV4, the Fireblade feels like an armchair. So the next time somebody tells you the ‘Blade is comfy, cough politely, but persistently, until they add ‘for a sports bike’. We were supposed to be meeting at the Countess services on the A303 at 8am, ready for a blast up to North Devon in search of great roads, superbike perfection and cream teas. Llel and I rolled in fashionably late at 8:15am to find Phil the photographer on his KTM Adventure, stacked to the sky with camera equipment. Shaun was already on his third can of monstrous energy drink and John was nowhere to be seen. Wait there, voicemail, this’ll be him. Blah, blah, one new message, yes, get on with it, “I got over excited. I was having too much fun and, er, kept riding. I’m in Yeovil, see you in forty miles.” For reference, John was on the BMW HP4, listening to Reef and riding faster than he should have been. That pretty much set the scene for the next two days of testing – forgetting about the job in hand and charging off to the next set of bends. And then the next set. And then swapping bikes and doing it all over again. These things may be exquisite eye-candy bikes, but shame on anyone who thinks they’re too precious to ride; they’re all too damn good not to. Getting up early and putting in 100 motorway miles on a Panigale wasn’t a problem in the slightest. A touch of tingly fingers was as bad as the aches and pains got for me on the way down there. Slogging through 150 motorway miles on the 1199 after two full days of riding was less pleasant. By the time I rolled into the sofa in my living room, my knees were sore, my neck stiff and my backside was unhappy. It would be easy to rip the Panny for being too focused and uncompromising at this point, but consider this: Llel did exactly the same number of miles as me, but rode back on the Honda and he wasn’t in much better shape. The Ducati feels less comfortable, but at the end of a long ride, neither bike leaves you feeling refreshed – adventure bikes they ain’t. What did bring a smile to my face each time we refueled was stepping back and looking at the Ducati. The ‘R’ version sports Öhlins mechatronic suspension, full carbon fibre bodywork, Brembo M50 monobloc brakes, Termignoni racing exhaust and ‘Ducati Corse’ stickers on the bright red flanks. You can’t see the Titanium conrods, but you know they’re there which makes looking at it even more special. So special you just have to get on and try out the 500rpm-higher rev limiter. In terms of visual impact, the Aprilia is special, the BMW purposeful, the Honda classic and the Ducati in another league. You get the impression it only lets you hang out with it because it’s pissed off at daddy. Actually, I’ve stumbled on a pretty good way to describe riding the 1199R there – pissed off. It sounds angry as the super-loud Termi system echoes off the ground. Climb on, reach down to the wide, low bars and as you pull away the aggression continues. At low rpm, the Panny R really is pissed off, lurching and tugging at your arms, urging you to pick up the pace. When you give in, it responds by smashing your teeth out with the top yoke as 195hp tells gravity where it can stick its 9.81 metres per second squared. Holy f*ck this thing is brutal. 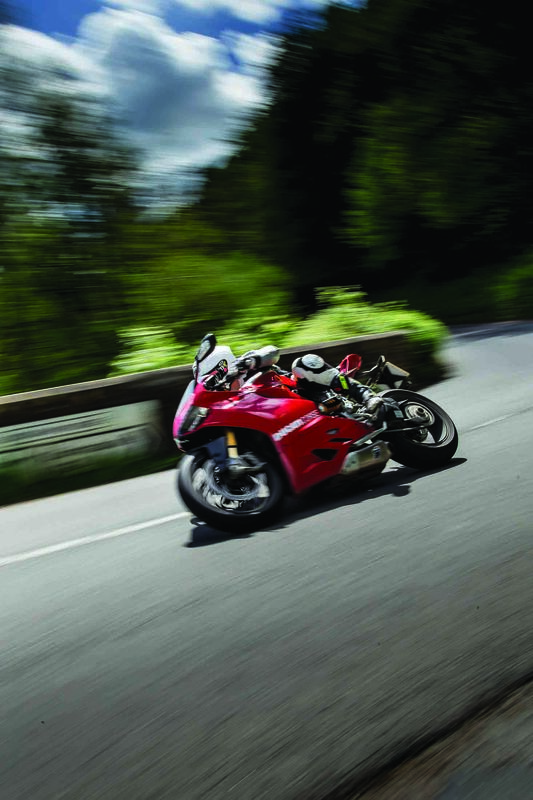 If you think its crass and lazy to swear, you find me a phrase that ably describes the Panigale in first gear. I’ll give you a clue; it certainly isn’t ‘my goodness’. Once in your life, you have to experience a Panigale R in ‘195hp Hi’ mode with traction control on the lowest setting. It’s an experience akin to stepping into an ice cold shower in terms of whole-body and mind shock. Once you’ve come to terms with the violence the throttle can supply, the 1199 is insanely good on the road. The brakes are sublime, they need to be, and the way it changes direction is little short of hyperactive. The Panigale felt at its best when you grabbed it by the horns and went in fully committed, sliding it into corners and firing out the other side, eyes wide, front wheel hovering. It. Is. Intense. He’s only gone and missed the bloody apex. Again.